Rev. Robert L. Spiekerman, CSV, a renowned band director in Springfield, died Nov. 3, 1965 at St. John’s Hospital in Springfield, IL, following a stroke. He was 43. Fr. Spiekerman was born June 12, 1922 in Chicago and received his education at St. Viator Grade School, before attending St.Mel High School and DePaul University. It was at St. Viator Parish that he first came to know Viatorian priests and brothers. After serving in the Army during World War II, he decided to study for the priesthood. He entered the Clerics of St. Viator in 1946 and pronounced his first vows on Oct. 14, 1947 and his final vows on Oct. 17, 1950. 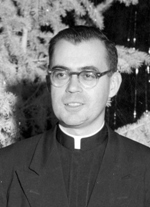 From 1947 to 1951, he studied at St. Thomas Seminary in Denver and was ordained a priest on May 20, 1951 at St. Andrew’s Church in Chicago by Archbishop Bernard J. Sheil. His first and only assignment as a priest was in Springfield where he taught at the former Cathedral Boys High School, which later became Griffin High School. During his more than 14 years in Springfield, he served as band director at both schools. Under his direction, the Cathedral and Griffin high school bands made numerous appearances at various musical events in Illinois and in nearby states. The band performed at the Indianapolis 500, NorthwesternUniversity football games, the Chicagoland Music Festival, the South Milwaukee Band Festival, as well as Illinois High School Association music contests and St. Louis Cardinal football games. He won vast acclaim and many awards with his bands. Fr. Spiekerman also served as director of bands at Diocesan Music Festivals. The band made numerous appearances in civic parades and other events. 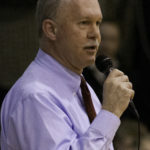 Besides the regular high school band, he organized and directed an all-city parochial grade school band, a grade school dance band and a high school dance band. A requiem Mass was sung on Nov. 5, at Immaculate Conception Cathedral in Springfield for relatives, friends and the students of Griffin High School. The solemn requiem Mass took place one day later at St. Viator Church in Chicago, celebrated by the Rev. John W. Stafford, CSV, provincial of the Clerics of St. Viator. Rev. Arnold E. Perham, CSV, preached the sermon. The choir and pall bearers all were students of the Viatorian Scholasticate in Chicago. Services at the grave in Queen of Heaven Cemetery were conducted by the Rev. Bernard G. Mulvaney, CSV, assistant superior general of the Viatorians in Rome.